The Garbage pizza with "a little of everything," at Puckerbrush Pizza in Payne, Ohio. 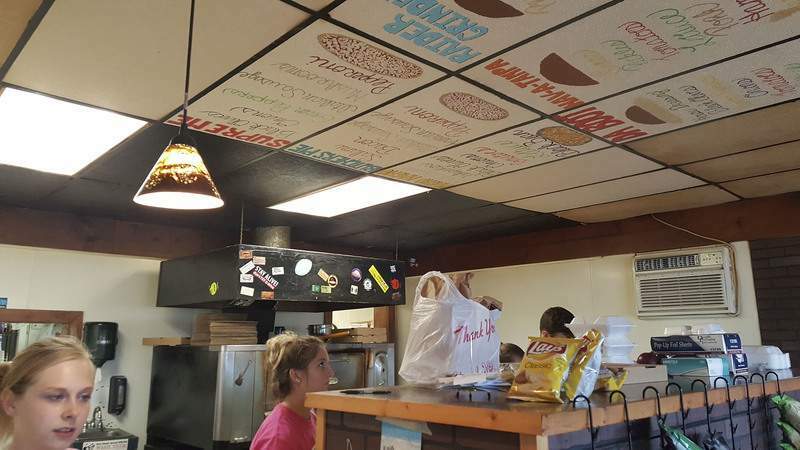 Employees work away below the cool instructioinal ceiling tiles in the kitchen of Puckerbrush Pizza in Payne, Ohio. 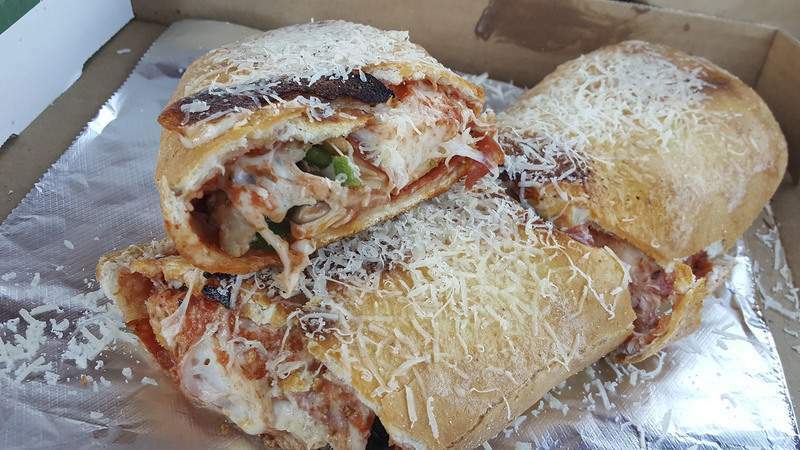 Supreme stromboli at Puckerbrush Pizza in Payne, Ohio. 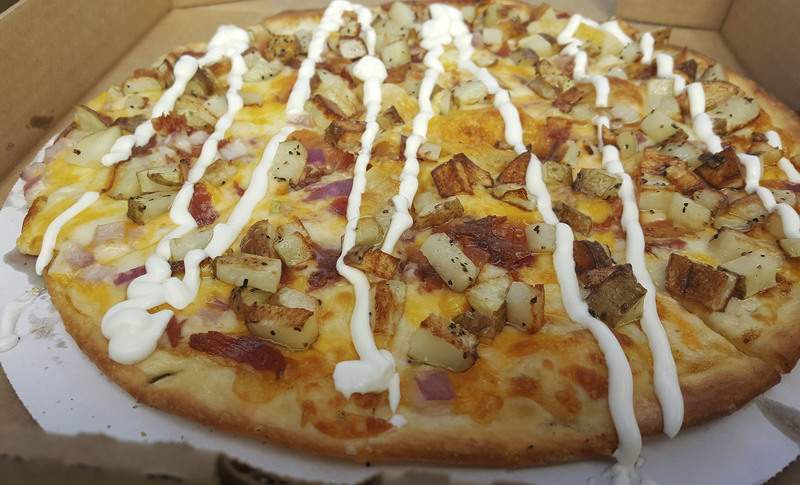 The Loaded Potato pizza at Puckerbrush Pizza in Payne, Ohio. Puckerbrush Pizza in Payne, Ohio. The Piggyback Hoagie at Puckerbrush Pizza in Payne, Ohio. Grilled tacos at Puckerbrush Pizza in Payne, Ohio. 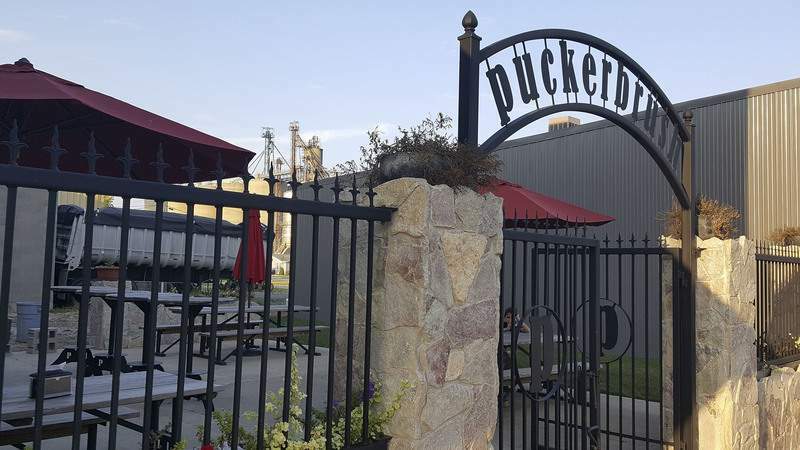 The patio area at Puckerbrush Pizza in Payne, Ohio, was very nice with custom made picnic tables and bar tables, and a nifty arching sign at the entryway. 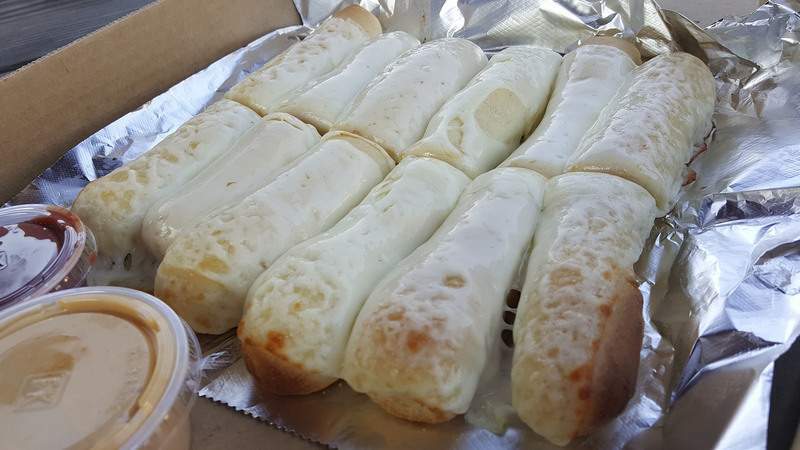 The cheese-coated breadsticks at Puckerbrush Pizza in Payne, Ohio, tasted as good as they looked. 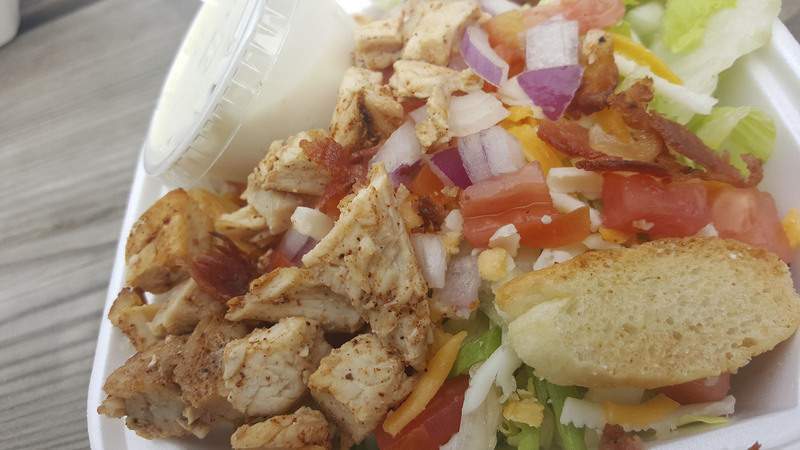 THe Smokin' Chopped Salad at Puckerbrush Pizza in Payne, Ohio. Though they make for a cool design element, the celiing tiles at Puckerbrush Pizza in Payne, Ohio, are actually there to help new employees. Black bean dip at Puckerbrush Pizza in Payne, Ohio. The Smokin' Rose pizza with pest and fresh tomatoes at Puckerbrush Pizza in Payne, Ohio. I had never been to tiny Payne, Ohio, but when a friend told me about a little pizza place there, I had to make the trip. 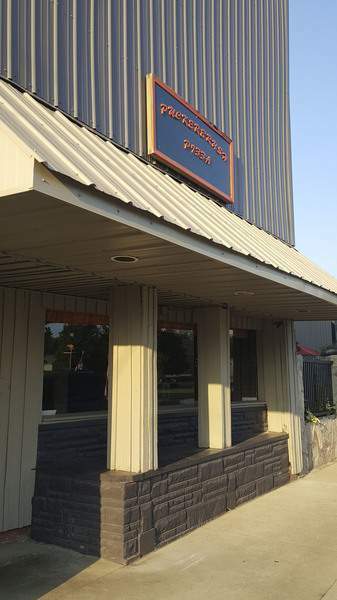 Puckerbrush Pizza is kind of a lone wolf in this town of around 1,100 people about 20 miles east of Fort Wayne. It is pretty much a take-out place, but it has a cool patio area marked by custom-made, powder-coated picnic tables and an arched entryway with the restaurant's name carved in the same kind of black metal. So you can sit down and relax while you eat outside for a little while longer before the weather turns. What made Puckerbrush worth the trip was its unique pizzas and the quality of those pizzas. The crust was just right. The slices were big, floppy and foldable, sort of like New York-style pizza, but it was not New York pizza. 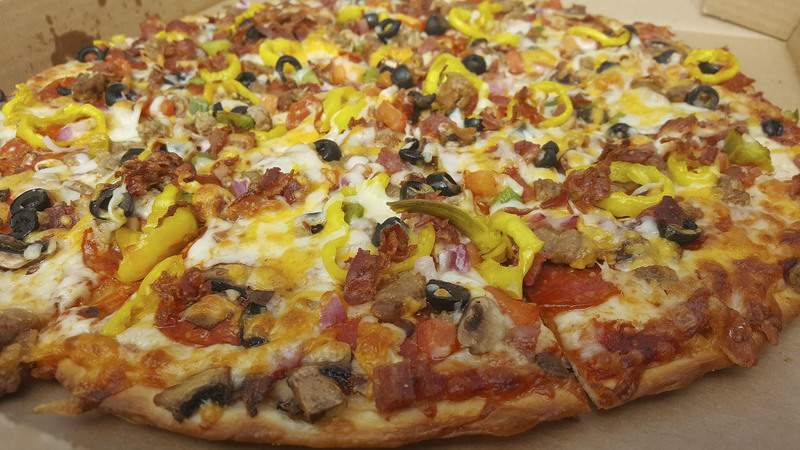 The hand-tossed crust was much thinner and crisper so it did not fold under the weight of toppings. The house-made sauce also had the perfect balance of flavor so it had some zing with a touch of sweetness. That sauce was just right for dipping Puckerbrush's fantastic breadsticks into. They were plump, very soft and bread-like with a glaze of garlic butter on top. I had mine blanketed with mozzarella and got a side of “K-SO” – what the restaurant calls its queso cheese sauce – and had nary a complaint. I also had no complaints with the Garbage pizza. There is a Supreme with pepperoni, Italian sausage, red onions, green peppers, mushrooms and black olives, but the Garbage had all of that and “a little of everything,” including salami, ham, American sausage, ground beef, bacon, banana peppers, green olives, diced tomatoes, and cheddar, feta and Parmesan in addition to mozzarella. It wasn't just that this pizza had such a plethora of toppings, it was how evenly distributed they were that made it my favorite. You got everything in every bite. The Loaded Potato pie had ranch instead of red sauce, cheddar and mozzarella, bacon, red onions and the cubed potatoes. It was drizzled with sour cream as a finishing touch. The skin on those roasted potatoes – something I have not had on a pizza before – got a little crisp in the oven and really worked well on the pizza. The only thing it needed was maybe some chives or raw green onions to give it another layer of flavor. It was good, but came off as a little mundane once I had my second slice. The Smokin' Rose pizza was oddly named since there was really nothing smoky about it, but I still liked this pesto-based pie quite a bit. The fresh basil pesto that replaced the sauce was perfect with the fresh tomatoes on top. It, too, could have been better had those tomatoes been in big, juicy slices instead of diced. Payne is where I also found one of the best strombolis I have ever had. 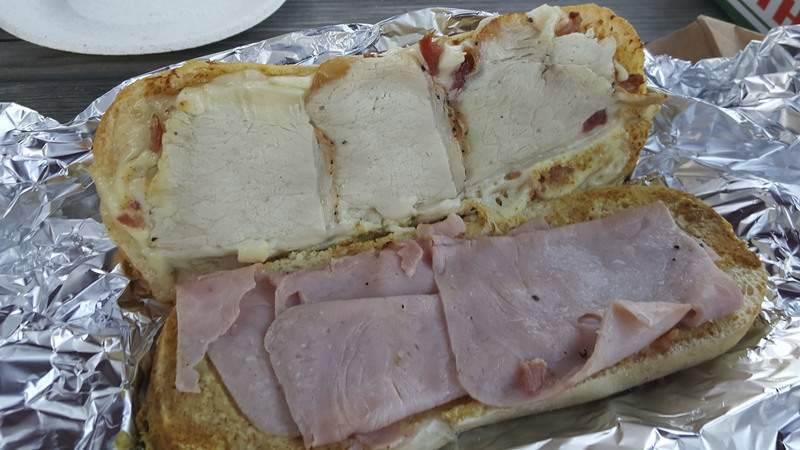 The Supreme had the same ingredients as the pizza stuffed into a super crunchy dough shell that had Parmesan cheese melted until brown all over the top of it and garlic butter. There was a lot of stuff inside so it did drip out all over, but that crust stayed crunchy from the first bite to the last. The green peppers really popped and there was a hint of garlic in every bite. Given it is sort of a lone wolf in a small town, there were many non-pizza offerings to sort through at Puckerbrush. One of those, which also had smoke in its title, indeed had something smoked in it and won me over. The Smokin' Chopped Salad, which was full-meal sized but that the folks at Puckerbrush gladly divided so I could share it as an appetizer, had smoked chicken, onions, bacon, tomatoes, cheddar jack cheese and excellent little house-made croûtons over iceberg lettuce. The Grilled Tacos intrigued me because I was imagining them with dark char lines from the grill. These tacos were not actually grilled, however, but were still pretty tasty. The thick flour tortillas were nicely crisped in the oven and the mix of black beans and cheese, along with beef and/or chicken, was quite nice. The iceberg lettuce and tomatoes didn't wilt under the heat, either, which was a plus. 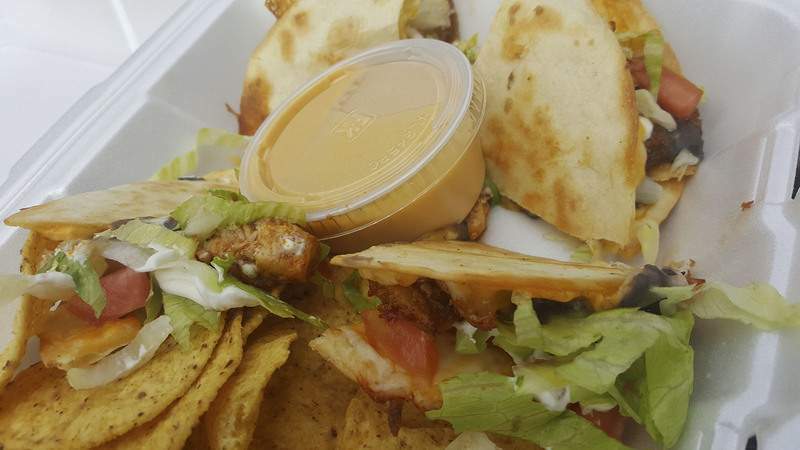 My chicken taco was better than the beef as it seemed meatier and the spices on it stood out more. The black bean dip was also a fine option as an appetizer. It had the perfect consistency – not too thick or thin – and its flavor was on point. With a little cheese melted on top, it was worthy of having again. 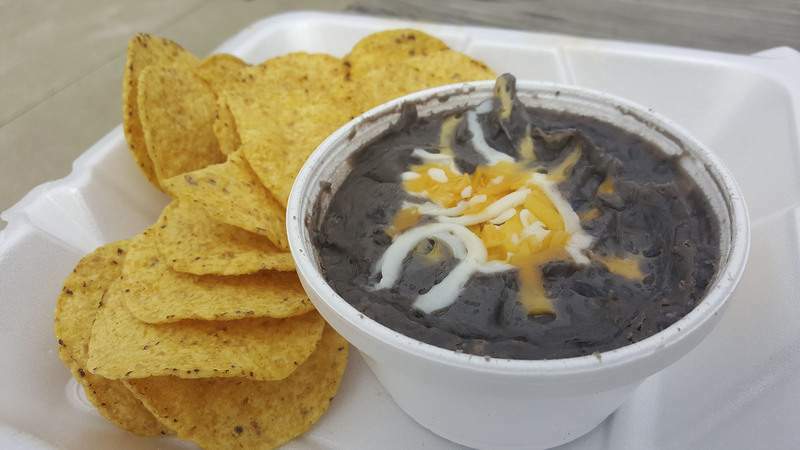 The black bean soup – Puckerbrush just started making its seasonal daily soups again – was also respectable, but not as good as the dip. The only item I did not approve of was the enticing-sounding Piggyback Hoagie, which had ham on top of roast pork on top of bacon topped with Swiss cheese and a smear of brown mustard. The meat was kind of scant, the pork was sliced too thin and the ham was pressed deli-meat which underwhelmed. Even though there is only a little counter area for dining in – there is a lunch buffet option for those four seats – I was well attended to when sitting on the patio. The food was brought out to me just like a sit-down eatery. Plates were only available during one visit but foil sheets were provided when they weren't. The inside of the pizzeria was pretty neat, too. 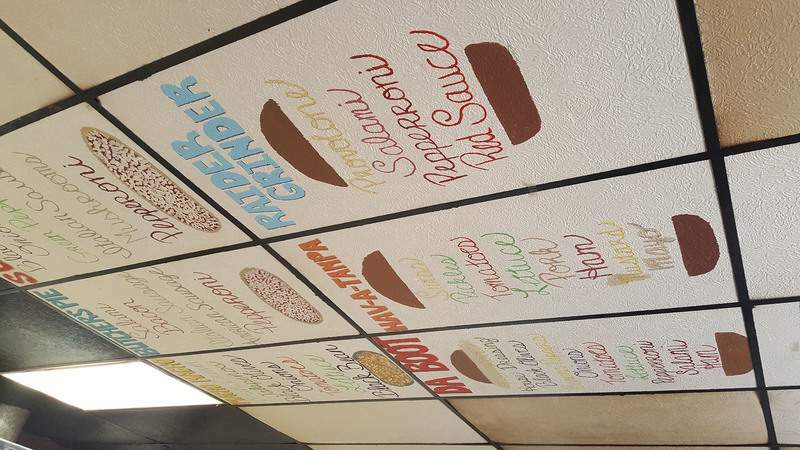 The ceiling was covered with colorful, hand-painted signs with recipes for some of the pizzas and sandwiches. I marked it up to being a clever design idea, but was told they were actually there to help train new employees. Regardless, they were cute. And so was Puckerbrush Pizza. 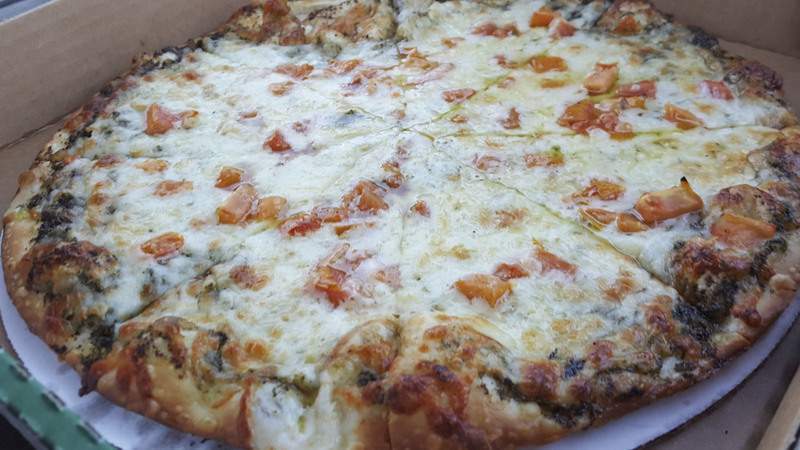 Not only was it a great excuse to get away and savor a peaceful evening in a small Ohio town away from the hustle and bustle, it was also a great place to get some really tasty pizza.